Design bundles like this are the most affordable way to get the best creative tools to use in your projects. As designers we always feel most inspired when working with amazing tools at our fingertips. From gorgeous glitter effects, to vibrant florals and cute illustrations, you’ll find countless hours of fun in this collection! The 98% discount drops the $1717 price tag to just $29, making it a great opportunity to get some professional quality resources that will open up a whole world of new artistic styles to explore. 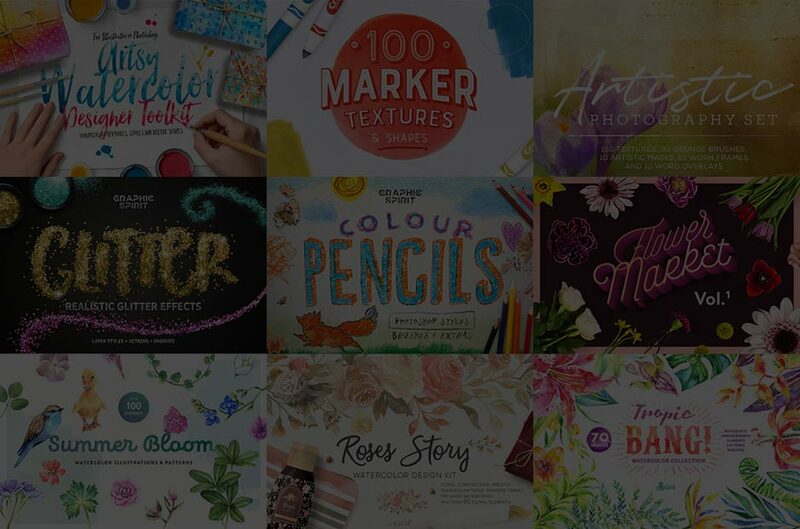 Check out the full overview of The Vibrant, Artistic Design Bundle to see the collection of hand-drawn illustrations, floral designs, patterns, innovative brush packs, textures, watercolour packs, glitter effects, crayon effects, and a range of amazing graphics packs on offer. All these resources come with full extended licensing, so you’re totally safe to use them to create fantastic design material! I loved it, congratulations to the blog! I always go back and get some tips. Awesome! Brave! Beautiful! Inspiring! Thanks so much for taking the time to make and share this post.